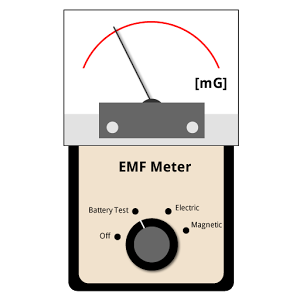 EMF Meter Phone Apps – Do They Work and/or Indicate Dangerous Conditions? 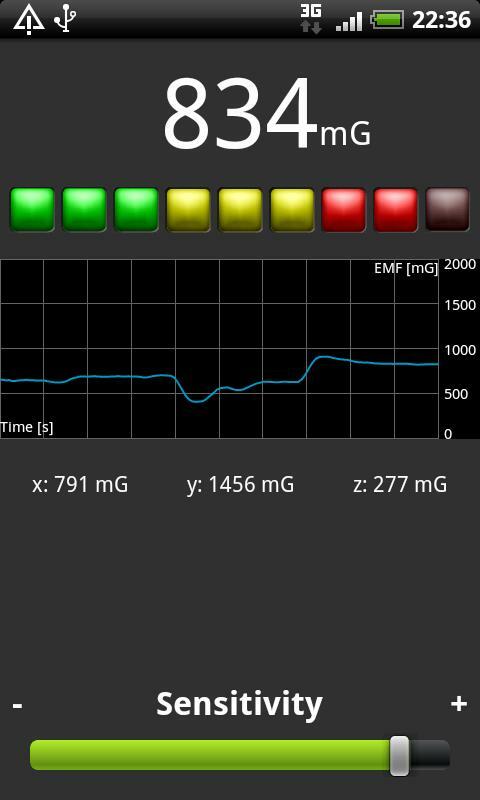 3) That cute app that you can download onto Android (and probably your iPhone) that measures magnetic fields. So does this app really work? Yes, but NOT in the manner that you think. It works as far as measuring the NATURAL DC magnetic field of the Earth which varies according to locale and the proximity of ferromagnetic building material. But DC means there is no frequency or fluctuation in the field; it is by definition 0 Hertz or 0 cycles per second as opposed to the North American power grid frequency of 60 Hertz. There is very little evidence that DC magnetic fields are harmful in any way (except higher intensity fields than Earth normal to those with certain biomedical implants such as pacemakers, ICDs, implantable defibrillators, etc.) and in fact there are patents on medical devices which use low level DC fields to speed the healing of broken bones. But look at the overall reading above showing 834 milliGauss (mG) with the bar graph registering ominously in the red. And speaking of which, the “green – yellow – red” color coding scheme is something I object to in EMF / RF testing instrumentation as it is completely arbitrary from a technical standpoint and induces needless fear-mongering with regard to actual safety levels. It is done partly as a marketing feature to make it look cool, but also as an attempt to give some kind of intuitive user knowledge about the EMFs in the environment, but in fact instills false confidence and infers incorrect information. While I can give a brief overview of bio-electromagnetics to my clients while consulting, diving into the details is an incredibly complex subject that even a B.S. in Electrical Engineering does not fully prepare you for. You also have to have biomedical knowledge of human and cell physiology (thus, my continuing education and credentials as a biomedical engineer) plus at least some understanding of disease epidemiology and probability / statistics which makes this a truly interdisciplinary field that few understand well. While the Earth’s magnetic field is typically around 500 – 600 mG, this can be either concentrated or attenuated significantly when inside of the frame of a steel building. What can potentially scare people with this app is that they read about Swiss safety limits of 10 mG, 2.5 mG or even 1 mG and then they assume this reading means they are in some sort of danger. I can guarantee that this meter does not measure anything having to do with health or safety with respect to AC power lines. The reason for having DC magnetometers built into a smart phone is so that it can relate relative positions of the phone (such as when you turn it on it’s side) with respect to the Earth’s magnetic field and respond accordingly. It is a cool app to play with and I have it on my phone, but it is not something I would use for a professional EMF inspection, nor would I use it to advise a client on the health, safety or risk conditions of their environment. 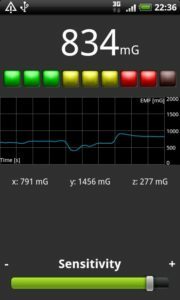 This entry was posted in EMF Meters, EMF Testing Bio-Electromagnetic Health & Safety Levels and tagged Android tablet, EMF meter, EMF safety levels, emfs, iPad, iPhone, magnetic field, phone app, RF on November 30, 2013 by jagman777.